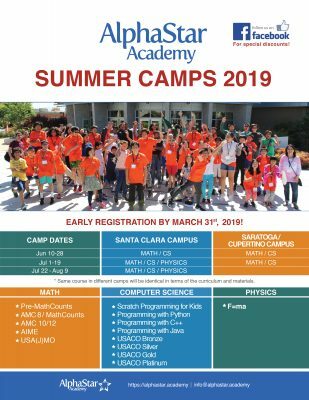 AlphaStar Summer Math Camp is a unique opportunity for interested and talented students to improve their math skills during summer season. Students are guided and trained by an expert faculty via utilizing national and international competitions in a fun and challenging environment. 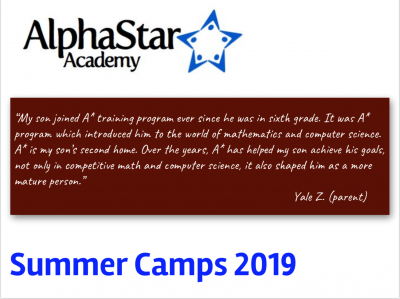 AlphaStar Summer Math Camp is 3-week long with 15 instructional days during weekdays. The same camp is offered multiple times during Summer for the convenience of our parents and students. There is no difference among the camps in terms of curriculum and material. AlphaStar Curriculum, previously known as A-Star, is being used since 2008 and continuously improved by our faculty. Starting Summer 2019, we are introducing AlphaStar Curriculum 2.0 with some major updates. During the camp, students will be provided with necessary background in lectures and trained with different types of problems to master various problem solving techniques. The classes are problem solving-based, whose curriculum is aligned with prestigious national and international competitions. Please check http://mathcounts.org/ and http://amc.maa.org/ for more information about these competitions. Lectures will be given and problem solving strategies will be taught in Number Theory, Algebra/Analysis, Geometry, and Combinatorics. The camp provides a motivational and challenging environment for students. There are eight levels at the camp as listed below. For more details and diagnostic exams, please click on the course name below. AlphaStar Summer Math Camps Faculty and guest lecturers for upcoming and former camps are listed below. Paul Dreyer is a mathematician at the RAND Corporation in Santa Monica, CA. At RAND, Paul uses mathematical modeling and simulation on a wide variety of military, energy, and security issues. Recently, his work has concentrated on aircraft survivability and how airbases operate while under attack. He also teaches courses on quantitative problem solving in the Financial Engineering Department at the UCLA Andersen School of Management and has consulted on multiple game shows including Million Second Quiz and Let's Ask America. He is also the president of the American Regions Mathematics League as well as one of its authors. He received his PhD in mathematics from Rutgers University in 2000, writing his dissertation on the applications of graph theory to problems in facilities placement, modeling opinion formulation in groups, and methods to speed up searches through protein sequence databases. Prior to joining RAND, Paul spent summers working at the National Security Agency in Fort Meade, MD and one of its subcontractors, the IDA Center for Computing Science in Bowie, MD researching topics in cryptography and computer security. In 2011 to 2013, Paul also worked as a trader at Jane Street Capital. Author of the book for Olympiad students: "Competitive Geometry"
Very good teacher at physics.